Memory of Iraq’s artist of unreality. The world had lost Layla Al – Attar twenty years ago. Her work remains. 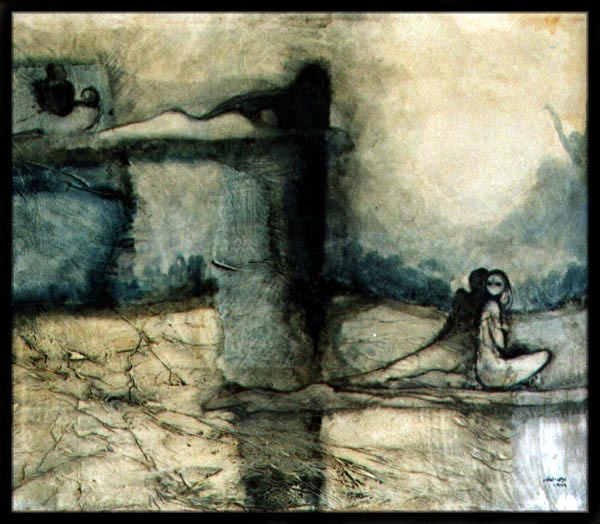 Layla Al – Attar was an Iraqi artist and painter. She had once held five one-women shows in Iraq and took part in all national and other collective exhibitions held in the country and abroad. She was also the director of the Iraqi National Art Museum. The primordial forest is a recurrent theme in Al Attar’s work and refers to a magical primitive world of Gilgamesh, the ancient king of Uruk in Mesopotamian legend dating 4,000 years, as well as the Garden of Eden, also believed to have been located in Mesopotamia. She has represented Adam and Eve in her work, using distortions of space and light to point to the sense of unreality of this world. On June 27, 1993, Layla, her husband and their housekeeper, were killed by a U.S. missile attack on Baghdad which was ordered by U.S. President Bill Clinton in retaliation for an alleged assassination attempt by the Iraqi Intelligence Service on former U.S. President George Bush, during his visit to Kuwait in April 1993. These allegations were not proven. The attack also blinded her daughter. Layla is survived by her sister Suad, one of Iraq’s most-celebrated artists (I will write about Suad and her work sometime soon). Kris Kristofferson dedicated and wrote a song about Layla called “The Circle”. → Zena El Khalil: Beirut’s pink bride under the black sky. ← Ultra-Orthodox Jews to Join Israeli Military.